Baltimore to D.C. in 15 minutes by train? A prototype of the Japanese maglev train. 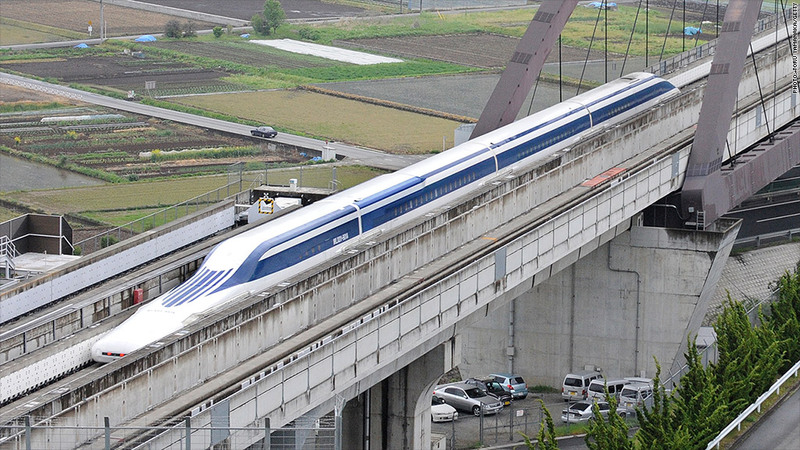 Japan is offering $5 billion in financing to build a maglev line between Washington and Baltimore. Washington to Baltimore in just 15 minutes. By train. That's what backers of the idea -- including the government of Japan -- promise. And they're betting $5 billion that it can really happen. The $5 billion is a down payment. Estimates range from $10 billion to $15 billion for a Washington to Baltimore maglev line. Japan, which has just started its plans to build a maglev line from Tokyo to Osaka, hopes that by providing the financing it will spur demand for its technology in the United States. Prime Minister Shinzo Abe has been pushing his country's maglev technology in meetings with U.S. political and business leaders. The backers of the Washington-Baltimore line, The Northeast Maglev, hope to eventually extend the line the full 225 miles from Washington to New York City. Some estimates put the cost of the New York to Washington line at far more than $100 billion. Some high-speed rail proponents in the United States are critical of maglev proposals, arguing the money could be better spent on lower-cost services using traditional tracks. The only operating maglev train in the world is in Shanghai, which can travel the 19 miles from the airport to the city in only seven or eight minutes, reaching a top speed of 268 miles per hour. But that is only a small portion of a 6,800-mile high speed rail network China is building using traditional tracks. The fastest train currently operating in the United States is Amtrak's Acela Express, which takes just under 3 hours from Washington to New York and between 34 to 38 minutes from Washington to Baltimore.